Innovative technology offering a wide range of decontamination products and services designed for global infection control. Binary Ionization Technology (BIT) is a patented two-step process that activates and ionizes an EPA registered solution of 7.8% Hydrogen Peroxide (H2O2) solution into a fine mist/fog called ionized Hydrogen Peroxide (iHP). The Defense Advanced Research Projects Agency (DARPA) and a large U.S. defense contractor joined forces to develop TOMI BIT platform and its SteraMist brand. White Papers, Safety Data Sheets (SDS/MSDS), Efficacy Materials, EPA Label, Media, Today in Infection Control, and other information on TOMI and its SteraMist brand can be found here. Find out how to implement the SteraMist mobile, hand-held point and spray EPA registered Hospital-HealthCare disinfectant label into your facility. Find out how to implement SteraMist sprayers and the iHP process to eliminate all contamination challenges within critical environments faster than any competing technology and without the production of caustic byproducts. Find out more about the community of trained and licensed technicians who daily combat disinfection and decontamination issues, deodorize, and perform mold remediation using the BIT platform and SteraMist brand. Find out more about how TOMI's aerosolizing technology disinfects fresh produce, fish, meats, fowl and their eggs while also extending the shelf life of fresh flower using activated aerosolized antimicrobials to preserve quality and reduce spoilage. 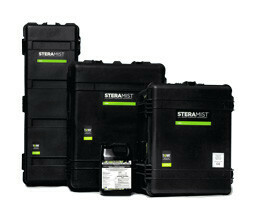 To discover how SteraMist can be implemented in your industry contact a TOMI divisional representative now!